Luther Allison was a well-known but rather elusive figure in the blues world prior to his first Alligator album in 1994. Prior to the release of Soul Fixin' Man, Allison spent most of his time in Europe and to that point had not recorded an album in the United States since the 1970s. Soul Fixin' Man was released to critical acclaim and and in a way it re-introduced him to the American blues audience. Alligator followed a year later with the equally outstanding Blue Streak, the second of four Allison albums. Reckless followed in 1997, the same year that Allison passed away from the effects of lung cancer, with Alligator's final Allison release being a two-CD live set in 1999, Live in Chicago. One could argue the merits of all four Alligator albums for being the best of the group, as each is an outstanding example of Allison's intense, back alley Chicago blues. As much as I loved the first release, Soul Fixin' Man, I've got to go with Blue Streak as the one I'd choose to have in my 'desert island' collection. Blue Streak makes the cut for one primary reason --- the inclusion of "Cherry Red Wine," a song that I consider to be one of the best blues compositions of all time. A fantastic extended version of "Cherry Red Wine" was also included on Live in Chicago, so I'll also accept the argument that this disc should instead make it to my hypothetical desert island. But it's not just all about me, as Blue Streak won honors for the best contemporary blues album of the year at the 1996 WC Handy Awards while "Cherry Red Wine" was selected as the blues song of the year. 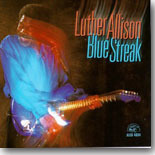 The dozen cuts on Blue Streak were recorded in two different sessions, with 10 of the 12 songs produced by Jim Gaines at the 315 Beale Studios in Memphis and the other two recorded in Eau Claire, Wisconsin and produced by Allison and longtime bandmate James Solberg. The Memphis Horns providing backing on four of the cuts recorded in Memphis. Let's start with the aforementioned "Cherry Red Wine." This is about as blue as the blues gets, with Allison pouring every possible emotion from his soul into both his guitar playing and singing, ripping out his heart over the relationship with his woman being destroyed by her affinity for that cherry red wine. He ends the song with the heart-wrenching line, " ... even the grass that grows on your grave will be cherry red ..." Incredible .... just absolutely incredible. But now, back to the beginning of the album. Allison kicks it off with the extremely intense "All The Kings's Horses," with two of the most incendiary guitar solos you'll hear on any blues song. Following is a cover of a Magic Sam classic, "What Have I Done Wrong," that definitely has a feel of the original but with Allison's more raspy vocals crying out the lyrics. Allison gets more primal on "Big City," a slow blues on which he plays slide guitar and puts a little more emotion into the vocals. The next cut, "Move From The Hood," is one of the album's better tunes, a mid-tempo shuffle with some smokin' guitar riffs in the middle. Here he sings about typical inner-city problems. still topical more than 20 years later. Keyboardist Mike Vlahakis gets to shine on both piano and organ on "Walking Papers," another mid-tempo shuffle. Allison is telling his baby that she's got to go or maybe that he's leaving, but he expresses mixed feelings about the imminent departure. Allison shows that he's more than just a blues cat on the very soulful "Think With Your Heart," starting off with exquisite horn work from The Memphis Horns and followed by Allison doing his best Otis Redding imitation on vocals. Andrew Love comes in midway through the song with a fine tenor sax solo. It's one of the best cuts here, and it just shows the versatility as an artist that Allison brought to the stage. Just when he's ripped out everyone's heart with that soulful tune, Allison then moves on to an up-tempo blues shuffle, "You Don't Know," with The Memphis Horns still on-board while our main man tears off a couple more hot guitar breaks. A great foot-tapper thatgets the blood flowing. Closing out Blue Streak is another soulful original, "Midnight Creeper," with The Memphis Horns returning to help Luther ask his woman to stay home with him instead of going out midnight creepin'. This one is more in a Tyrone Davis vein, which is quite for my tastes. What a great album. Quite frankly, you can't go wrong with anything in the Luther Allison catalog. But if you don't have any of his recordings, Blue Streak is a good place to start.